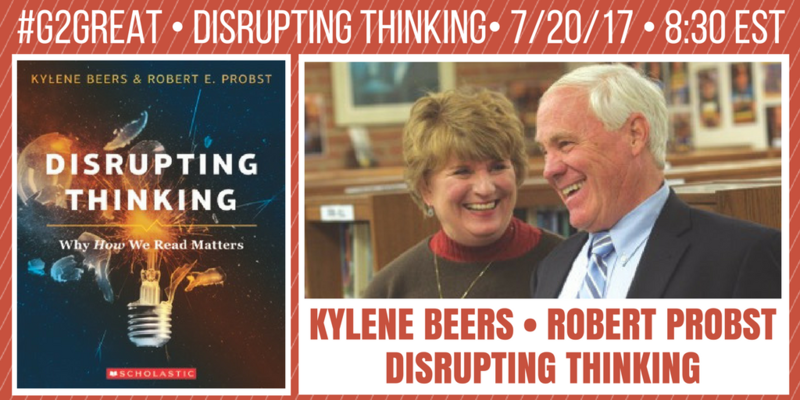 July 20, 2017 was a very special day on #G2Great because this was the day a long-time wish became a reality as Kylene Beers and Robert Probst settled into the #G2Great guest host seat. On this memorable evening, we launched a virtual style celebration of their phenomenal book, Disrupting Thinking: Why How We Read Matters (Scholastic). In an instant, exuberant hunger for the shared understandings that would disrupt our thinking stretched an expansive wing across Twittersphere (evidenced by an engaging conversation that exceeded the 1000 tweet storify limit). I vividly recall the first time I held this exquisite book in my hands and excitedly opened the cover to soak in their wisdom. They captivated my heart with words that read like a promise: The Readers We Want. But as I read those first pages, waves of sadness washed over me as a sense of professional urgency escalated with each tear. I revisit pages 14 to 17 often because they illustrate the tragic consequences that our choices can have on the reading lives of children. And that lingering image moves me to celebrate Disrupting Thinking in their honor. 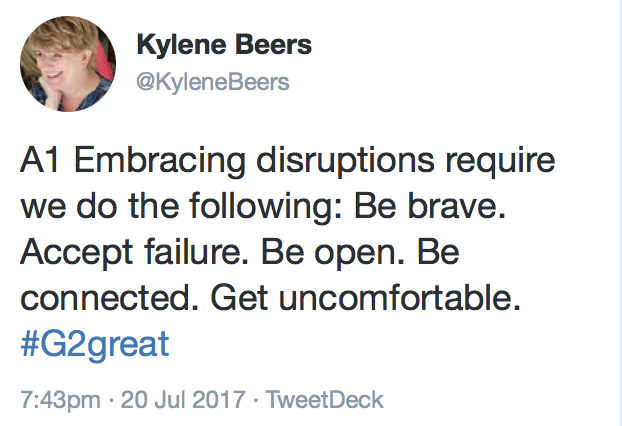 The moment I read Kylene’s words, I knew it reflected the big picture I wanted to capture in my post. 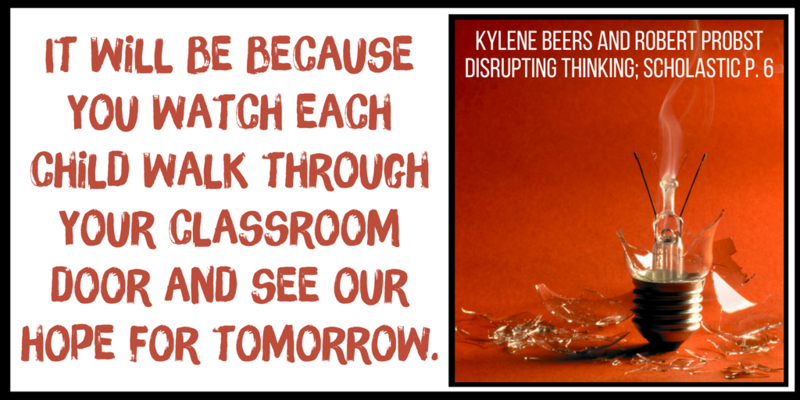 And so with her words at the forefront combined with inspiration from the entire chat experience, I’d like share six disruptions that we must embrace to bring disrupting thinking to life in countless classrooms with our lead disruptors guiding us from the sidelines. Looking back on the chat, one word was a thread connecting every tweet: CHOICE. This word was easily the most repeated and always in the context of students. If we have any hope of disrupting our thinking and thus that of our students, it will require us to celebrate the texts that are most likely to awaken deeper thinking and bring it to the surface because our readers care about their reading. We cannot make this shift to disrupting thinking if we’re not willing to thoughtfully select and share the best possible texts we can find and then provide time and space for students to choose their own. By embracing choice, we are opening the door to reading that will beckon students so that books will become the impetus for disrupting thinking. Using these texts to engage students in meaningful and productive dialogue was another idea repeated across the chat. The central feature of these discussions was exploring how to let talk to rise naturally from engaging text interactions. We discussed experiences ranging from opportunities to share with a partner, in a small group, or as a whole class but in each talk variations, the focus was on keeping students at the center of this discourse. We agreed that teachers must lay a strong foundation for talk by explicitly modeling their own thinking and then support this process until we can gradually relinquish responsibility to students. We acknowledge that students deserve a leading role on the talk stage and so we create a supportive environment so that we can to step back and listen to in-the-moment conversations and then use those conversations as a springboard to next steps. 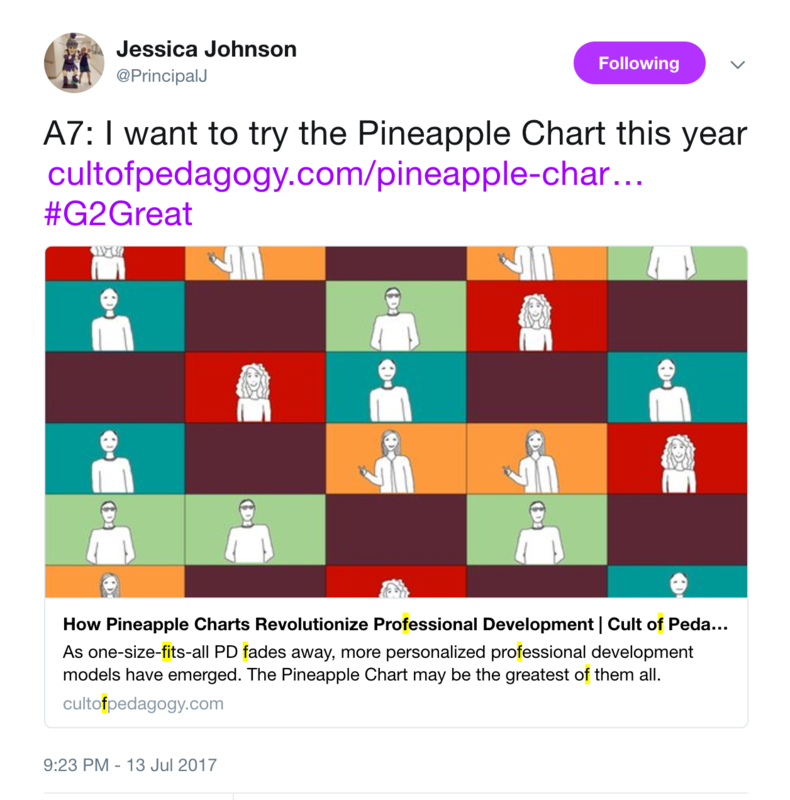 The collective professional dedication evident in tweets loomed large across our chat as we set our sights on crafting learning experiences that would maximize student impact. A common discussion theme was that student talk would revolve around these text experiences –­­­ not for the sake of a grade or score but because we knew that those opportunities could change their lives in some way. We agreed that such life-changing moments should extend beyond our four walls since our higher purpose was to create a reading experience that students would carry with them long after it was over. In other words, we knew that these experiences could only truly impact students when our instructional pursuits were designed in ways that students would carry their learning into their homes and into the world. The word respect was another recurrent word across the chat and it was used in the context of inviting students to disrupt their own thinking. We acknowledged that the ideas the author brings to the thinking table are certainly relevant to the learning experience, but we also agreed that we must respect student thinking by extending them an invitation to the thinking table to merge the authors ideas with their own. Through invitations we stand to learn much about students as we consider new ideas that we could not have possibly have imagined without this deeper engagement. And in this two-way thinking process we begin to ask fewer questions as we invite students to generate their own. We do this because we believe that their thinking matters as much as the author’s and because we know that we cannot disrupt thinking if each instructional move along the way is recorded in a step-by-step, question-by-question lesson guide. Looking back across our chat, educators readily acknowledged that the path to disrupting thinking is littered with unexpected twists, turns, pauses, and challenges that inevitably arise when we do not know the final destination. We celebrate the amazing opportunities that come from the messy process that is inherent in the risk-taking disrupting thinking asks of both teachers and readers. There was a common understanding that if we are willing to follow the student thinking trail that is oft-riddled with uncertainty, that this uncertainty could provide the room students needed to move their thinking to new discoveries with new uncertainties and discoveries with each step along the way. I doubt that there is a single educator who has read Disrupting Thinking who doesn’t recognize the professional possibilities of new thinking. 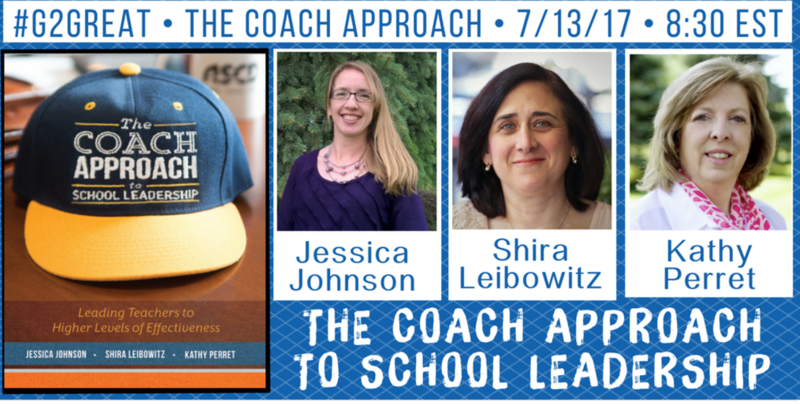 In a July 6, 2017 live Facebook event, Kylene and Bob reminded us that our goal is not just to identify “Best” practices but to explore NEXT practices. This central message of their remarkable book asks us to take a leap of professional faith from the first pages to the last. We do so willingly, meandering our way to the possibilities just out of view as we disrupt our own thinking and the thinking of our colleagues. 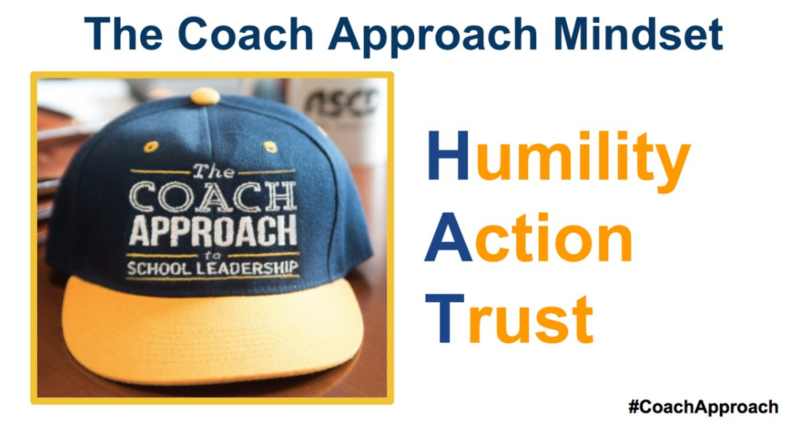 It is my hope that these ideas will raise powerful conversation that will bring NEXT practices into focus and inspire others from a schoolwide perspective. And we are all eager to explore those possibilities in the new school year ahead. In the introduction aptly titled Where The Story Begins, Kylene and Bob describe the seeds that grew into Disrupting Thinking with the words, “It Was a Child…” These three words should inspire celebratory professional wonderings that lead each of us to embrace our own disruptions in the name of kids. Thank you for filling us with new hope for tomorrow Kylene and Bob! 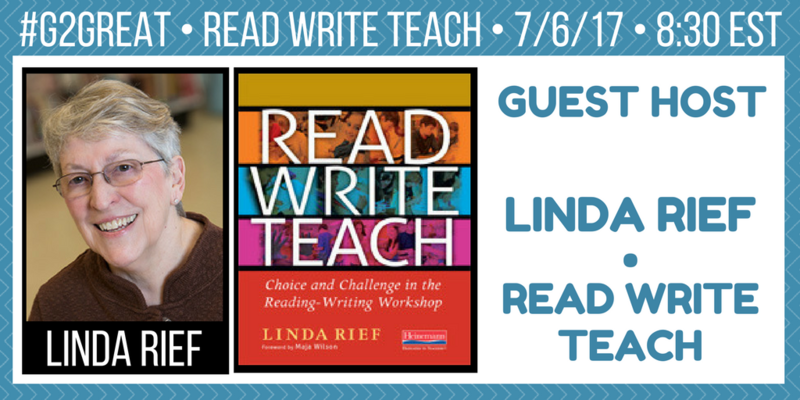 On July 6, 2017 #G2Great welcomed Linda Rief as a guest host to share her ideas around reading, writing and teaching. 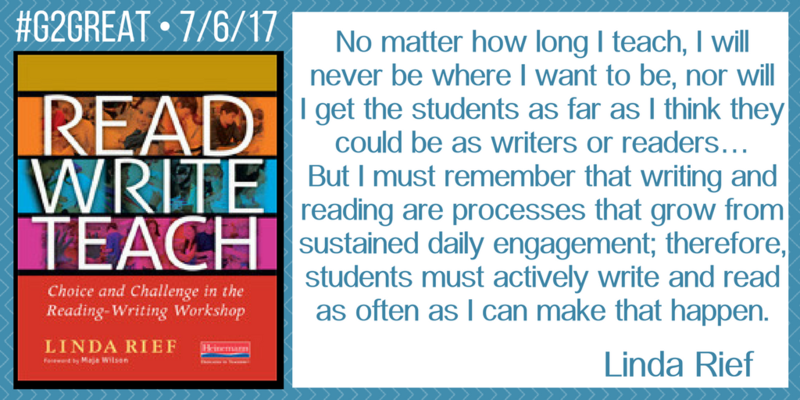 Linda’s book, Read, Write Teach explores reading and writing workshop sharing her thoughts about the choices and challenges that are inherent to a strong reading and writing workshop. Everyone has a story to tell. 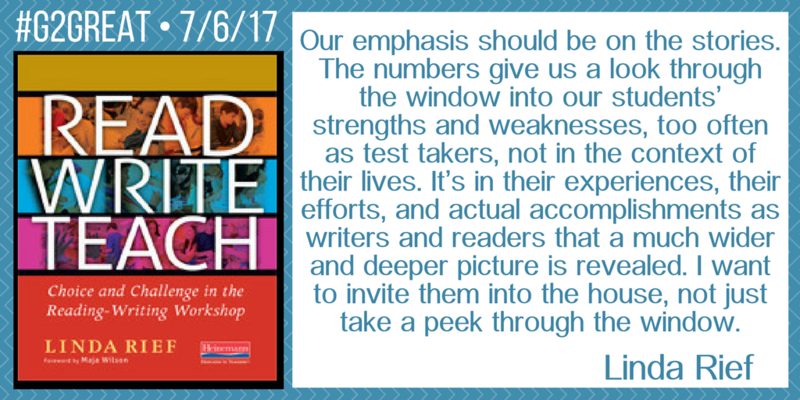 Linda reminds us that while data and test results show how students may have performed during a test, it neglects to show us how a reader or writer performs in the actual experience of reading and writing in their life, built on their experiences in an authentic context. It is this lens that shows us the deeper understanding of a reader or writer’s process and allows us to see what a student is doing and enables us to identify where to go next. Aside from choosing a multiple choice answer from the selections of a,b,c or d students have no choice in what they are reading on most standardized tests. In all truthfulness, that choice they make does not resemble any sort of real choice, in that they are choosing the best answer hopefully in line with what the test creator believed was the best answer. Choice is critical to readers and writers because it allows the reader or writer to fully embrace the process and ensures the belief that all learners have the right to learn and the capacity to learn. Learners have the best opportunity to learn when they are motivated to learn and being provided with choice supports a reader or writer in learning who they are as a learner and what really is important to them. We can begin the growth process when we allow our minds to be open and reflective. We must challenge earlier beliefs about mastering teaching and understand that no number of years as a teacher fulfills the title “Master Teacher” rather it is a reflection and revision process that develops the “Master Teacher” or what I prefer to call a “Reflective Teacher.” When we believe we are done learning and have mastered something, that is when growth stops, stagnation sets in and our best teaching lingers where it is, no longer pushing ourselves or our students as far as we can be as learners. A truly “Master Teacher” or rather “Reflective Teacher” knows that teaching is a practice, much like law, medicine or even yoga. Practice is what allows growth and by engaging in practice we are open to reflection and revision and therefore we can continually push ourselves and our students to be engaged in reading and writing every day, thereby growing every day. We continually grow by experiencing new things and being open to trying things we have not tried before. 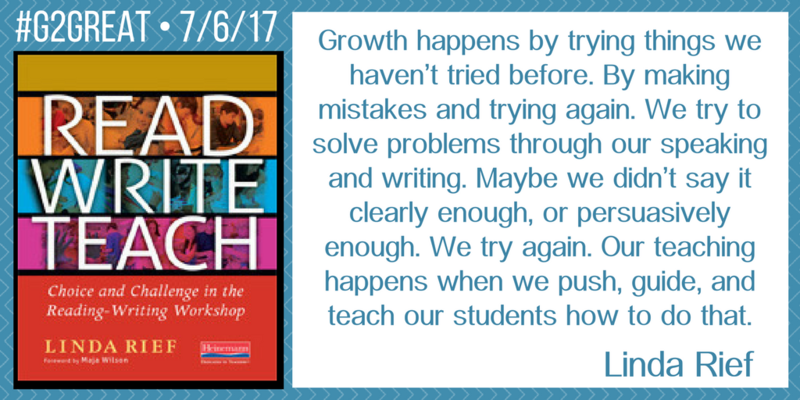 During our teaching practices, we can then experience multiple iterations and improve each time. I have often heard, “I taught that already and they still don’t know it” or “That was covered last year by the teacher before” or “They should have been taught this last year.” This problem gets compounded year after year until we start reflecting on our own practices, collectively as educators. It is not enough for only some of us to engage in this reflection and growth. All educators need to embrace the practice of teaching and reflect on each time we teach and consider what the student is learning. By focusing on the learning we can look through a lens for reflection by allowing us to go back over the teaching practices and connect what teaching happened and then what learning resulted. In order to continually grow, this practice needs to go through multiple trials, reflections and revisions. Additionally, because no two people are alike and no two brains are alike; this continually happens in order to foster growth in our teaching and in our leanring. As educators engage in this practice of learning, we need to also ensure that we are transparent to our students about our own learning and growth. This can provide a model for learning for our students, ensuring that their story contains opportunities for multiple iterations during practice along with reflection to foster growth. Everything that we do as educators is grounded in our WHY. Tina reminds us that our Soul Story WHY is to honor our students’ voices. When we place students in the learning driver’s seat, they become the center of the curriculum (not the other way around). Our deep belief that our students’ passions matter fuels an unwavering dedication to find and celebrate the miraculous stories residing within each child. Through our commitment to awaken the inner stories of students, their voices will rise up and reverberate across the learning day in ways that will shape our curriculum – and thus give it heart. Our schools reflect a beautiful patchwork quilt of remarkable children. When we honor our colorful patchwork and help students find and share their Soul Story with others, those stories begin to merge as our patchwork grows even more beautiful in the most amazing ways. We celebrate our differences but quickly begin to see similarities within them and know that each of these add to our patchwork. As Soul Stories come together, we are creating a respectful environment where compassion becomes our core and we can go about our work to nurture jubilant learning together on a day to day basis. The word ‘bravery’ seemed to stretch across tweets as teachers recognized that we set the stage for student Soul Stories by sharing our own. Before we can ask students to take the inevitable risk that comes with bringing our Soul Stories to life, we must be willing to take those risk with them. We demonstrate our bravery by immersing ourselves in each step of process as a stepping-stone for our students to forge their own brave path. 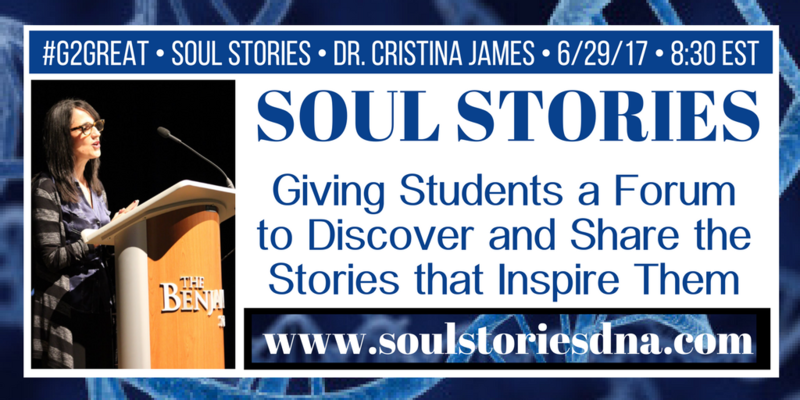 Soul Stories are far too important to relegate to an assigned task and so we embed Soul Story opportunities across the school year and form a Soul Story kinship. Once we help students find and hold tight to the Soul Story within, we then offer both oral and written explorations that will help them to deepen the inner wisdom of those stories. To do this we combine a wide range of experiences that help students breathe new life into their Soul Story. We acknowledge that this messy process of discovery will require support and provide flexible opportunities along the way to talk and write their way across their story. Within this meandering process, we give each Soul Story presence by dedicating time, support and space those stories deserve. Finding and crafting Soul Stories is only the beginning. As each student Soul Story starts to take shape, we offer many opportunities for students to share their stories with peers in meaningful and authentic ways. We demonstrate that we value sharing by ensuring that there is room in the day. We hold these opportunities in high esteem because we know that Soul Stories blossom in the company of others. In the process, we become a Soul Story family as we embrace our story and the story of others. As we peer through a two-way mirror of Soul Stories, we know that each one will add a new layer of meaning. Tina’s work at The Benjamin School is unique in that student Soul Stories develop into Tedx talks. The opportunity afforded to bring those stories to life on stage are powerful because they give students’ Soul Stories the gift of an audience. Tina’s commitment to Tedx is admirable and a lofty goal we can all work toward but each of us can find a forum to give students’ Soul Stories an audience. We honor each opportunity for students to share their stories because we know that each new sharing will infuse additional life into those stories in ways that will linger long after the experience is over. Tina’s tweet illustrates why finding, crafting and releasing Soul Stories into the world is well worth the time and effort. We talk a great deal about beginning at the end and the image of her words may well be what we want to envision as we work to celebrate Soul Stories. We set our sights on this celebratory culmination knowing that although Soul Stories reside within, giving those story a home in the company of others is the ultimate goal. And as we engage in each stage of this process, Soul Stories begin to intermingle as each story has the potential to enrich the next. I am walking away from this wonderful #G2great chat with Tina guiding us in reflecting on student Soul Stories with a deep appreciation of this process. As I think back on the chat, one tweet pulled it together for me. Since Georgia Heard first introduced me to Tina, it seems only appropriate to close with her tweet. Georgia’s words are a reminder that Soul Stories do not live in isolation but need caring, respectful others with an open heart to help us to awaken those stories so that we too can share them with the world.